This is a sponsored post through Collective Bias. 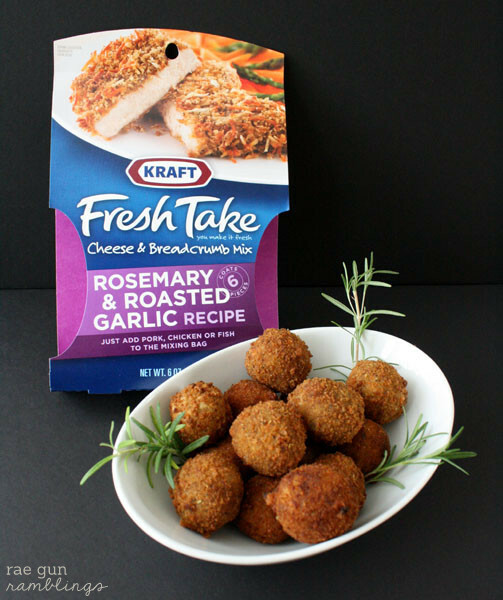 All opinions and ideas are 100% mine and I’m excited to share my experience with Kraft Fresh Take and my yummy croquettes with you! When I was in high school living in Thailand we’d go to the American grocery store after school sometimes and right next door was the Japanese market where they had croquettes. 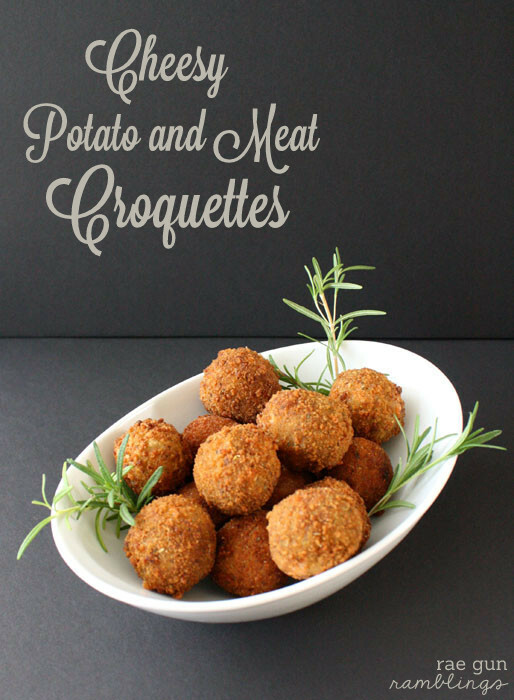 They were so delicious and I learned to love the potato and meat treats as a yummy after school snack or a fancier appetizer for dinner parties. I often make them to go with fondue. When I saw Kraft Fresh Take cheese and breadcrumb packs I instantly thought that they would make for a fun and cheesy twist on this favorite food of mine. 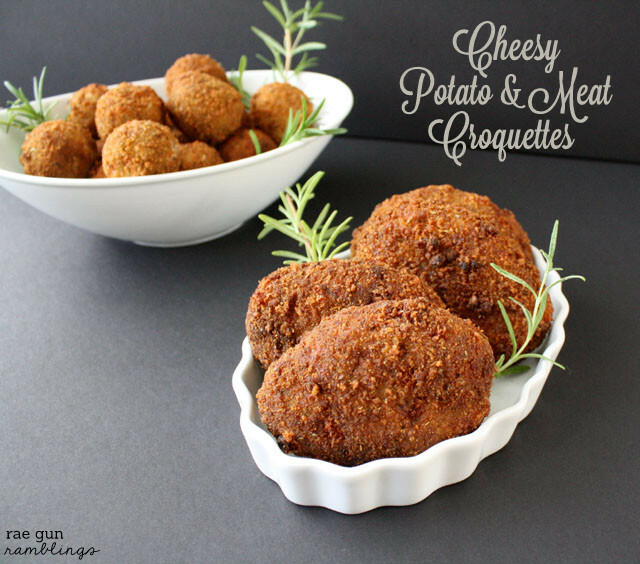 So today I have a cheesy potato and meat croquettes recipe that would be perfect for Thanksgiving, snack time, or whenever you’re feeling like some yummy filling comfort food. My favorite part is that you can make them ahead of time and freeze them to serve in whatever portion or time frame that works with your schedule. 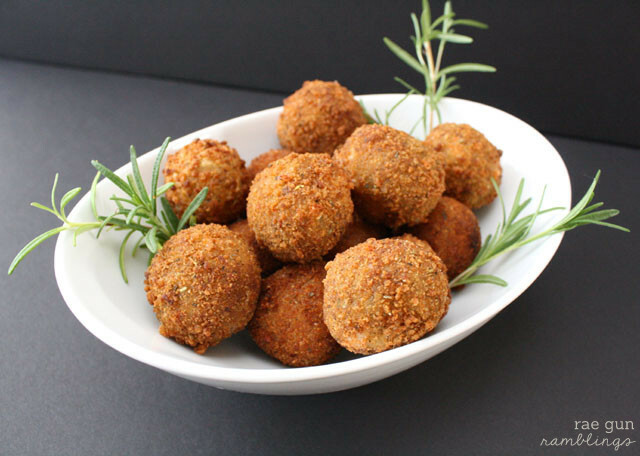 After years of making croquettes I really love the convenience and flavor options I got from using the Kraft Take kits. Start by browning your ground beef with salt, pepper, and onion powder while you boil your potatoes. Remove meat from heat and add your drained potatoes to your pan with your beef and mash. Add about 1/4 to 1/2 C milk and stir. Taste and add more seasoning if needed. Stir in Cheese from the Kraft Meal Kit. 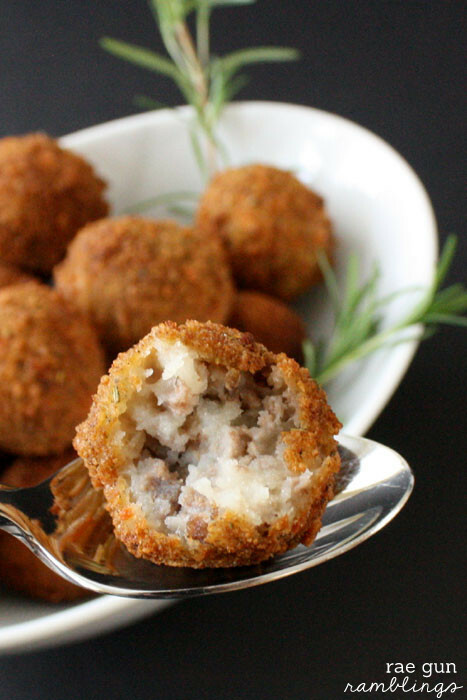 Roll into balls or patties and place on a cookie sheet. I like to pop them in the refrigerator for a few hours or overnight but I’ve also continued to the next step without refrigerating. They are easier to manage if they have some time in the fridge. Set up a breading station. Flour in one pan/plate, 1 egg beat with 1/4 to 1/2 cup milk in another, and then your bag of Kraft Fresh Take breadcrumbs. 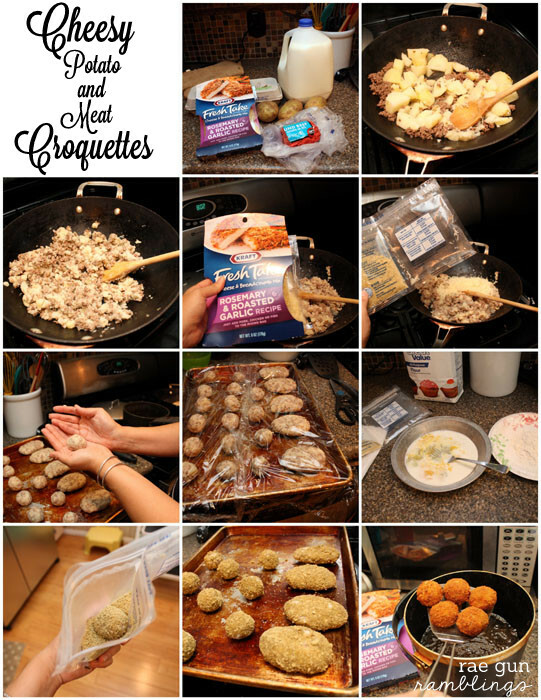 Roll the croquettes first in flour, then in the egg mixture and then toss in the bag and set on a dry cookie sheet. Once all your pieces are breaded and your oil is hot, fry until golden brown. Remove and allow to cool on a paper towel. The Fresh Take packs come in 4 really yummy flavors I’m excited to try the others. In all honesty I may have stood at the cheese section extra long trying to decide which mixture sounded yummiest for me to try first! And if you’re interested here’s a coupon for $0.99/1 bag Kraft Fresh Take mine was only $1.98 anyways. You can freeze them before OR after frying I have done both and it works well either way. If I freeze it after frying I usually just reheat it in the oven. I like to make the larger sized patties to have as a part of my lunch when I’m really busy and I usually warm it up in the toaster oven or oven. And I have to say we really really liked these. Yes I wrote this as part of a sponsored post but my husband wanted me to make sure and say how yummy they were haha. So there they are SUPER YUMMY. For a fun spin on these I’ve made them with Thanksgiving leftovers. All you’d need to do is to roll up some of your favorite Thanksgiving fix-ins into balls or patties and then bread like I explained above. 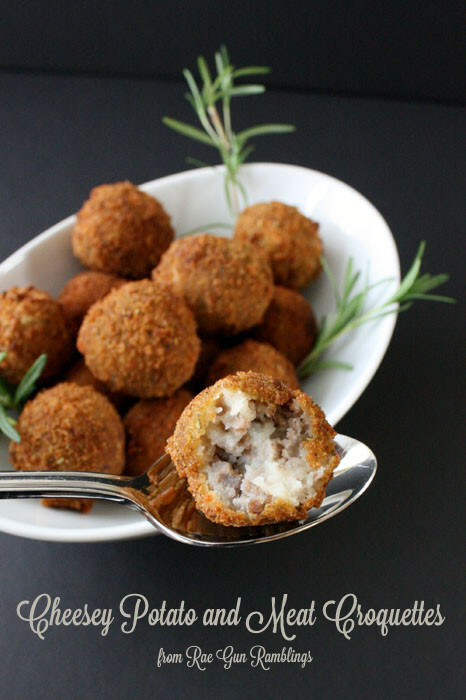 Mmmm in Japan we used to make croquettes all the time, now I’m inspired to make them again! Thanks! We totally need to make it an American thing they are so stinking yummy! Oh my WHAT?!? Those sound so delicious! How have I never had a croquette before? Love that you used the bread crumb mix to simplify the recipe! I’ve never tried something like that, but anything fried, plus potato and ground beef? These look delicious!! Oh my! Those look super tasty! Thanks and pinned. These look delicious! 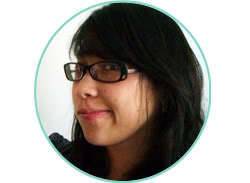 I love Kraft Fresh Take and would have never thought to use it like this – love the idea! Oh my gosh! these look incredible! I think I have to make these tonight!